It is an American tradition to display a Blue Star Banner in the window of a home when a loved one is currently deployed overseas in combat areas serving in the U.S. Armed Forces. The Blue Star Banner Is a reminder that war touches every neighborhood. The Blue Star Banner was designed and patented during World War I. During World War II, the Department of War issued specifications on manufacture of the flag, as well as guidelines indicating when the service flag could be flown and by whom. 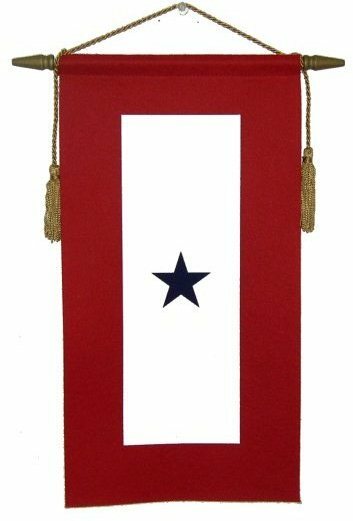 The Blue Star Banner is an 8.5-by-14-inch white field with one or more blue stars sewn onto a red banner. The blue star represents one family member serving, and a banner can have up to five stars. If the individual is killed or dies, a smaller golden star is placed over it. For many years, the banners went into a type of hibernation. The American Legion rekindled that spirit of pride in our military men and women following the Sept. 11, 2001, terrorist attacks by providing banners to military families across the nation. Now, the employees of the City of Wylie, the Wylie Chapter 4660 of Woodmen of the World and the American Legion of Wylie invite qualified families to apply for their very own Blue Star Banner! To apply, click here or contact Lynn Fagerstrom, Human Resources Manager for the City of Wylie at 972-516-6048 or lynn.fagerstrom@wylietexas.gov.